Hi everyone. It's almost Father's Day - what do you have planned for the men in your life? 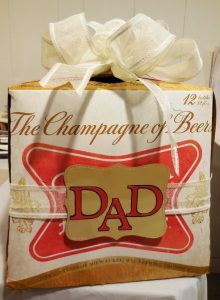 We know they love beer so why not give him some - decorated of course!!!!! Check out my post on the Bowdabra blog for details on how to decorate a gift he'll love! I used the Bowdabra to create the bow that adorns the handle, then wrapped ribbon around the case. Next, I die cut Rinea Gold/Gold Glossy Foiled Paper to create a label. On top I die cut DAD from cardstock and added the top layer in Ruby/Gold Glossy Foiled Paper. Rinea Foiled Papers cut wonderfully in my Cricut! Please stop by the Bowdabra blog for complete instructions.